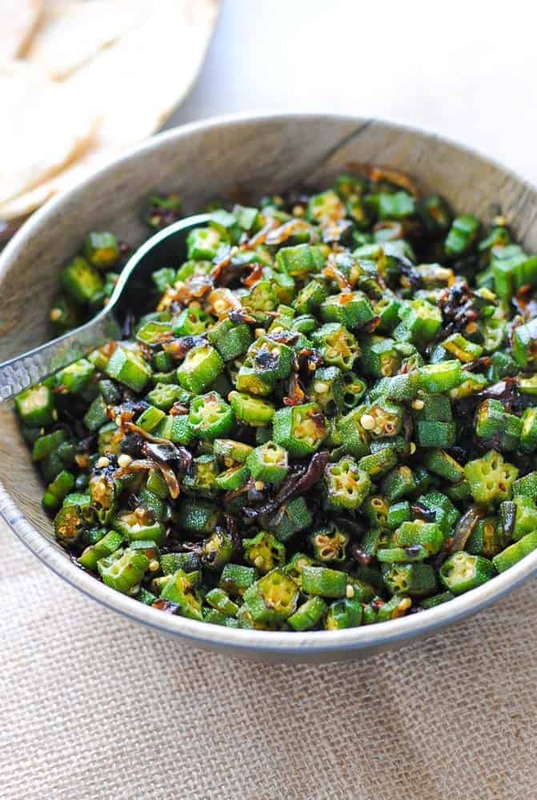 Bhindi Sabzi is an easy okra stir-fry that requires just a few simple ingredients. It is vegan, keto-friendly, gluten-free and can be put on the table in 30 minutes! Some evenings, the only thing I’m willing to look at is an old, trusted recipe that requires no special effort to make. No mile-long ingredient list, no complex flavours and no culinary acrobatics. Just a simple, tasty and healthy meal that will fill my belly and leave me satiated. Enter bhindi sabzi. Bhindi or okra is a vegetable I’ve eaten a gazillion times before and I don’t tire of it. Ever. The reason? It ticks all of these boxes here. It’s simple, it’s easy to make, it’s healthy and it’s tasty. 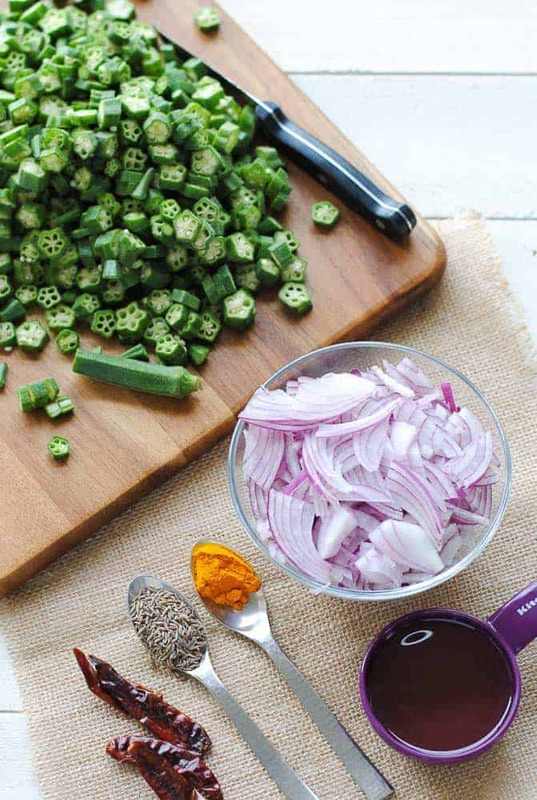 This healthy bhindi recipe has just 5 ingredients, (not counting the bhindi itself and salt) and is made in 30 minutes. And I love the way it tastes with warm roti or naan or any Indian bread that I might have. If you are gluten intolerant or on a keto diet, have it with flatbread made with flours like coconut. Here’s an easy flatbread recipe made with coconut flour. 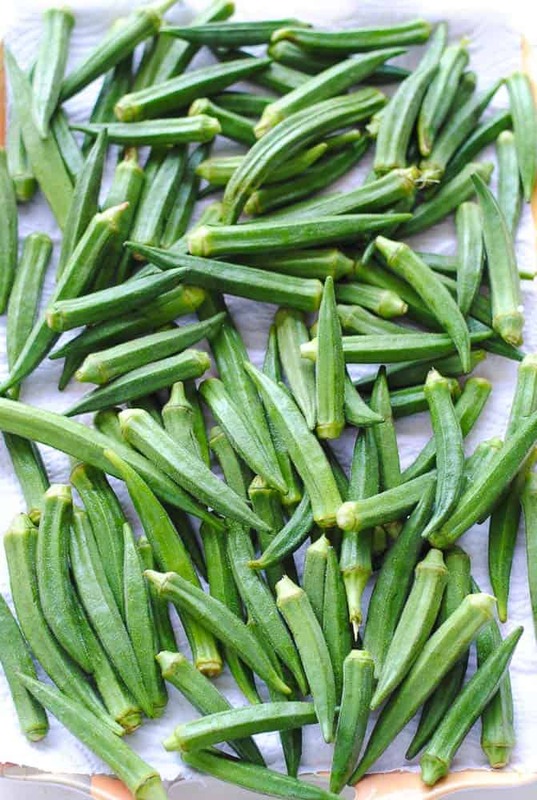 Fun fact: Okra is also called ladies finger in India! The only reason I can think of is that the variety of okra that grows there naturally is long and slim in shape instead of short and fat. So bhindi sabzi can also be called ‘ladies finger fry’, I guess:) Conjures a weird picture in the mind, for sure! 1. 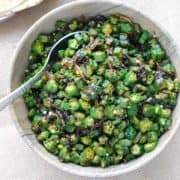 Fresh bhindi or okra – As mentioned, Indian okra is slightly different from its North American counterpart in that it is greener, longer and slimmer. This variety can be found in any Indian grocery, but if you don’t want to make that trip, by all means use the one that’s available more easily. 2. Onions – red onions are preferable although any kind will do. Slice them finely for the stir-fry. 3. Dry red chillies – Available in most markets, especially Indian groceries. Substitution – you can use one teaspoon red chilli powder instead of dry chillies. 4. Mustard oil – gives warm, spicy overtones to the sabzi. Most vegetable sabzis are cooked in mustard oil for that added punch. How to use mustard oil – Mustard oil in its raw state is not fit for cooking. You will want to smoke it before you can use it. Heat the oil until it starts fuming and becomes pale in colour. Then let it cool down enough to put the other ingredients in. Tip – Do air your kitchen after smoking mustard oil. The fumes can be quite pungent! Substitution – if you don’t have or want to use mustard oil, feel free to cook the okra in any oil of your choice like olive oil. I do it when I can’t be bothered with mustard oil. 5. Cumin seeds – one teaspoon is enough. 6. Turmeric powder – optional. No matter if you don’t have turmeric. It doesn’t make a huge difference to the sabzi. 3. While you’re cutting the okra, fry the onions until they are caramelized. The onions will be fried in about the same time it takes to cut the okra, so I do both at the same time. Just don’t forget the onions as you’re busy with the okra! 4. Add the cumin and dry red chillies also to the frying onions. 5. Once the onions are reddish brown in colour, add the okra and turmeric and leave it to cook, uncovered for 10-12 minutes. Give it a good stir with a wooden spoon now and then to prevent it from sticking to the bottom of the pan. Don’t add water at any stage to the sabzi. 6. In the end, add salt as per your taste. I deliberately add salt in the end to prevent the okra from releasing water during the cooking process. Serve the okra with any Indian bread of your choice. Use fresh okra if you can. Frozen okra just doesn’t cut it with this recipe since there is frozen water clinging to it. Your sabzi will become a pale mush if you use frozen okra. Make sure the okra is completely dry before you cut it. This is essential as even a little water can spoil the look and taste of the sabzi. DO NOT ADD WATER. Sorry for the caps, but this is the key to making a successful okra stir fry. If you add water, the okra pieces will break and you will get a sticky, gooey mess on your hands. So, do not add even a drop of water. There, I said it again! You might wonder how the okra will soften without water. Don’t worry, it will. And it happens quite fast too. When you start to cook it, the okra releases a sticky, gooey substance. But you’ll see that it starts disappearing as you saute the vegetable and is gone in a few minutes. This is also a measure of this veggie’s ‘doneness’. The okra is cooked through when the goop is gone! For the above reason, use a good non-stick pan or skillet to cook the okra. It will be easier to saute and will not leave a sticky mess to clean later. Add salt right in the end. I did say this before, but one of the ways you can make sure the okra remains moisture free is to add salt at the end of the cooking process. Salt draws out water from most vegetables and okra is no exception. If you follow these suggestions, you will have the most beautiful green okra stir-fry ever, I promise you that. Have okra with some warm naan and a salad for a simple but satisfying meal. 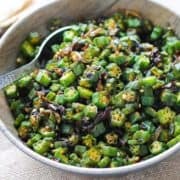 Bhindi Sabzi is an easy okra stir-fry that requires just a few simple ingredients. It is vegan, keto-friendly and gluten-free. Can be put on the table in 30 minutes! Heat the mustard oil in a pan until it starts to smoke and changes colour. After it cools down a bit, add the sliced onions and fry them until reddish-brown. While the onions are frying, wash the okra, pat it dry it and cut it in small, even pieces. Add the cumin and dry red chillies to the frying onions. Add the okra and turmeric. Cook, uncovered on medium heat for 10-12 minutes, or until the okra softens. Give it a good stir occasionally. Add salt just when the okra is done. Serve hot with Indian naan or rice. Make sure the okra is dry before you cut it. Don’t add any water during the cooking process. Add salt towards the end when the okra is cooked. I am always looking for a new authentic dish to enjoy at home. This one sounds fantastic! Okra is one veggie that I love, but can never find a recipe that incorporates it. Until now 😉 making this next week! Do tell how it turned out! Thanks for posting Eva. It’s unfortunate that fresh okra is not available where you live! I won’t ask you to use frozen okra for this recipe since it jsut doesn’t taste good. That looks like a very delicious and satisfying dish! Thank you for sharing, I will try this! Absolutely stunning simple side dish! Pinning this one to return to during the summer months when I have more okra than I know what to do with! I love okra and it’s nearly at every restaurant in the south. I’ve never seen it prepared this way. Do the chilis add heat to it? This sounds flavorful and perfect for this week! The chillies do add a bit of heat but you can adjust them according to your taste and preference. I generally throw in two dry ones but if even two are too much add just one or even half! Totally up to you. I’ve never tried cooking with okra before but this looks delicious. I’m also intrigued by the mustard oil as I have never come across this. I’d really like to try this recipe. Your okra looks beautiful. I bet it does make an excellent stir fry. It looks delicious and I love the seasonings you have in there. 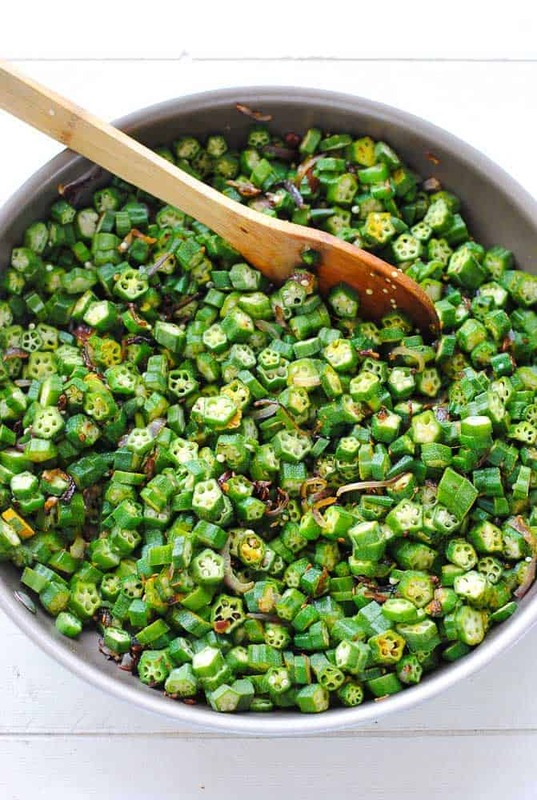 We’ve made okra before and we liked it, but I know we’d LOVE this recipe. Would make a great side with any protein. I’ve never had orka before but I’ve only ever seen it fried. I love your version here…the salad is so beautiful and sounds fabulous! Tammy, this is a stir-fry, not a salad!